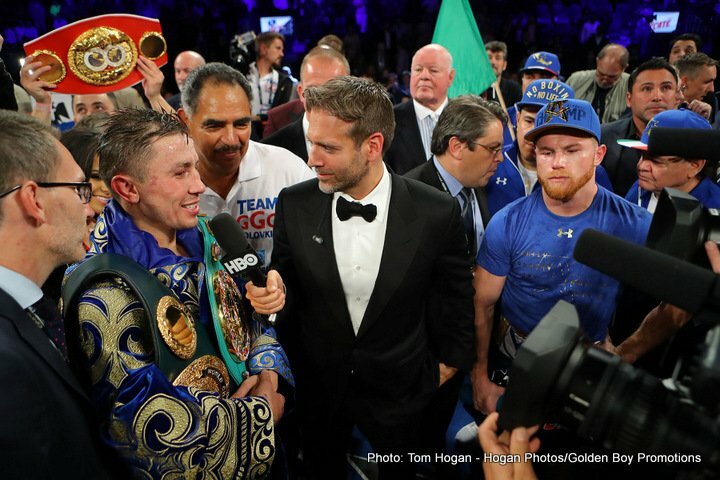 By Jeff Aranow: The judges for the rematch between Saul Canelo Alvarez and Gennady Golovkin will be under close examination by boxing public on September 15, according to promoter Tom Loeffler. After the odd scores turned in by two of the judges last year for the Canelo-Golovkin fight, the judges selected for the rematch are going to find themselves watched closely by the public to make sure they don’t turn in another set of scores that don’t match the fight. The previous Canelo vs. Golovkin fight was ruined by the judges when they scored it a 12 round draw. “The officials will be under a microscope,” Loeffler said. It would be bad for Canelo’s career if he’s saved from another loss by the judges, because he would be seen as being pampered and protected. Canelo can’t have that happen like that repeatedly against Golovkin. Canelo has got to be able to stand on his own two feet in the sport; otherwise he’s going to look like a phony in the eyes of the boxing public. “The rematch has the potential to be even bigger than the first match,” Sulaiman said to wbcboxing.com. ”The fighters never know when their legs are going to go or when they will lose their speed, but Gennady always comes to fight in a phenomenal way,” Sulaiman said. There’s a lot of anger between Gennady and Canelo. The anger will create a lot of fuel to create what should be an amazing fight on September 15 at the T-Mobile Arena in Las Vegas, Nevada. Canelo, 27, knows that he cannot use the same type of movement as he did in their previous fight last year, because GGG is going to do a better job of staying in front of him and cutting off the ring. This should help Canelo. He’s always done well when competing against pressure fighters that were standing close to him. Golovkin knows from his fight last September that he’s going to need to stay right on top of the 5’8” Canelo for him to land his shots. If GGG stays on the outside again, like he did last time, it’s going to allow Canelo to move to his left all night long to evade his pressure. Canelo isn’t going to change that part of his game, because it enabled him to evade his pressure and take badly needed rest breaks. For GGG to win this fight, he’s got to be able to keep Canelo from resting like he did a year ago in Las Vegas. Canelo is a much better fighter when he can rest as much as possible, considering that he’s a short burst fighter. Canelo fights hard for 10 to 15 seconds and then follows this with rest breaks. If GGG can take away Canelo’s recovery periods, he’ll have a big chance of exhausting him and scoring a stoppage as long as he doesn’t have some other tricks up his sleeves. Boxing is a complex sport. When a fighter doesn’t have the engine to stand and fight hard against a pressure fighter, they’ll use a number of strategies to slow down the pressure. We could see Canelo try one of the following tricks: throwing low blows, holding, running, pretending he’s hurt with a low blow when GGG throws shots on the belt-line, or asking referee for a timeout if he’s hit with a shot that is on the side or back of his head. “Hopefully both of you have a good preparation for the fight, let’s see what they can contribute and achieve for future boxing fans in the world,” Sulaiman said.